The City of Menlo Park is updating its Parks and Recreation Facilities Master Plan. The Master Plan includes an extensive public process to evaluate community needs and assess the conditions of the city’s parks and recreation facilities. The plan serves as a road map to guide future decisions about our local parks, open space and recreation system for the next 20 years. 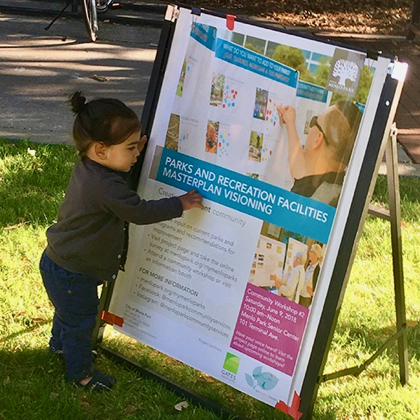 The public is invited to join the Parks and Recreation Master Plan Oversight and Outreach Committee meeting Thursday, April 4, 2019, from 6:30–8:30 pm at the Arrillaga Family Recreation Center, as it reviews the draft guidelines and recommendations developed following the past year of community outreach. The Committee will also discuss the timeline and important project milestones. An online survey opens Wednesday, April 3 and runs through Friday, April 19, 2019, to gather comments on the draft guidelines and recommendations, as well as the parks and facilities that are most important to you. The guidelines help shape future park and facility policies and decisions. The recommendations provide clearly stated ideas about improving current parks and facilities. Please share your thoughts and comments on the parks and facilities that you love and enjoy. Visit menlopark.org/mymenloparks to complete the survey and provide your comments.